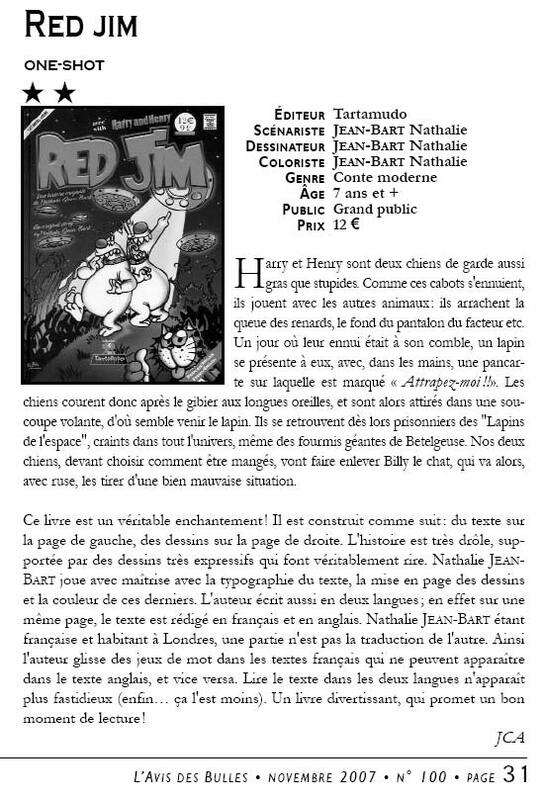 My children's book Red Jim has received its first review and a very positive one as well in the professional French magazine "L'Avis Des Bulles". Harry et Henry sont deux chiens de garde aussi gras que stupides. Comme ces cabots s'ennuient, ils jouent avec les autres animaux: ils arrachent la queue des renards, le fond du pantalon du facteur etc. Un jour où leur ennui était à son comble, un lapin se présente à eux, avec, dans les mains, une pancarte sur laquelle est marqué « Attrapez-moi !!». Les chiens courent donc après le gibier aux longues oreilles, et sont alors attirés dans une soucoupe volante, d'où semble venir le lapin. Ils se retrouvent dès lors prisonniers des "Lapins de l'espace", craints dans tout l'univers, même des fourmis géantes de Betelgeuse. Nos deux chiens, devant choisir comment être mangés, vont faire enlever Billy le chat, qui va alors, avec ruse, les tirer d'une bien mauvaise situation. Harry and Henry are two guard dogs as fat as they are stupid. But they are also very bored, so bored in fact, they only find some enjoyment by playing with other animals: they tear foxes' tails off and the bottom of the postman's trousers, etc. One day, as the two dogs are bored to the extreme, a rabbit turns up in front of them, with a sign in his paws saying "Catch me!!". The dogs are only too happy to oblige and chase the rabbit, until they are all sucked up inside a flying saucer, where the rabbit seems to have come from in the first place. From now on, Harry and Henry are held prisoners by the Space Rabbits, feared across the all universe and, even by the Giant Ants from Betelgeuse. The two dogs, forced to choose how they are going to be eaten, make the Space Rabbits kidnap Billy the cat who will ultimately trick their way out of trouble. This book is a pure delight! It is built as follow: the text is on the left page and the drawings on the right page. The story is very funny and supported by very expressive cartoons that cause genuine hilarity. Nathalie Jean-Bart shows skill in playing with the typography of the text, the layout and colours of the drawings. The author's also written the story in two languages: the text is told in French and English on the same page. Nathalie being French and living in London, parts of the text aren't the literal translation of the others. The author inserts puns in the text in French that cannot appear in English and vice versa. Consequently, reading the text in both languages doesn't seem tedious anymore (at least, not as much...). An entertaining book that promises enjoyable reading! Don't forget to check the lens I wrote about RED JIM, for more information about the book itself, where to get it from, etc.